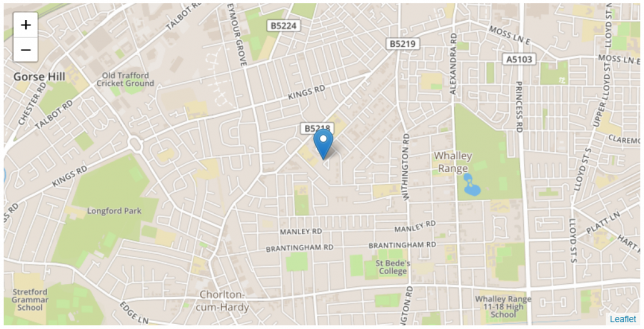 We currently provide a service available at geoconvert.ukdataservice.ac.uk, which allows a user to discover information about a UK postcode or convert data between its census geographies. This provides useful information for academics, researchers and other users who understand these types of things but can be a little bit more difficult to interpret for new and novice users. I set about trying to create an application that can connect to the same database but pull out similar information in a more user-friendly and ‘simpler’ format. 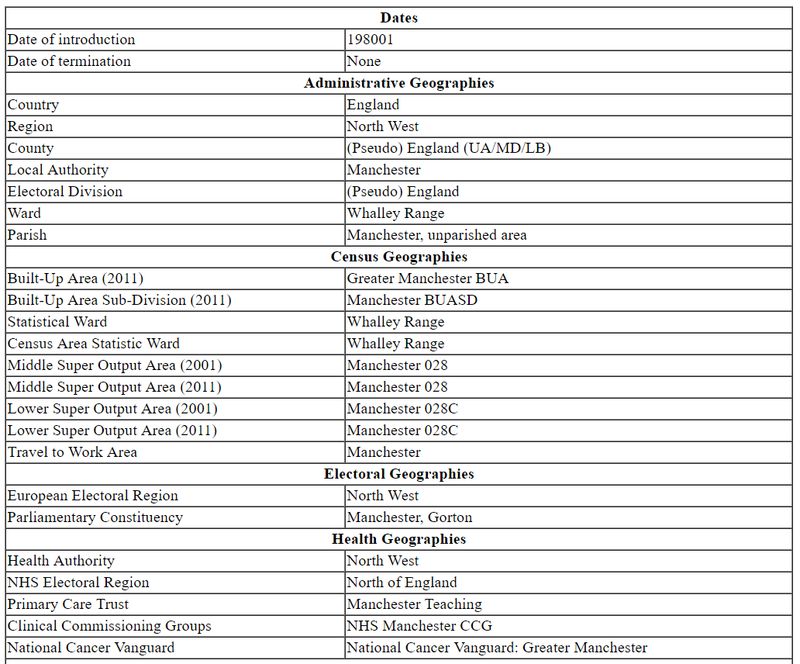 The first step was to download the most recent version of the open data from the Office of National Statistics (ONS) geography portal. 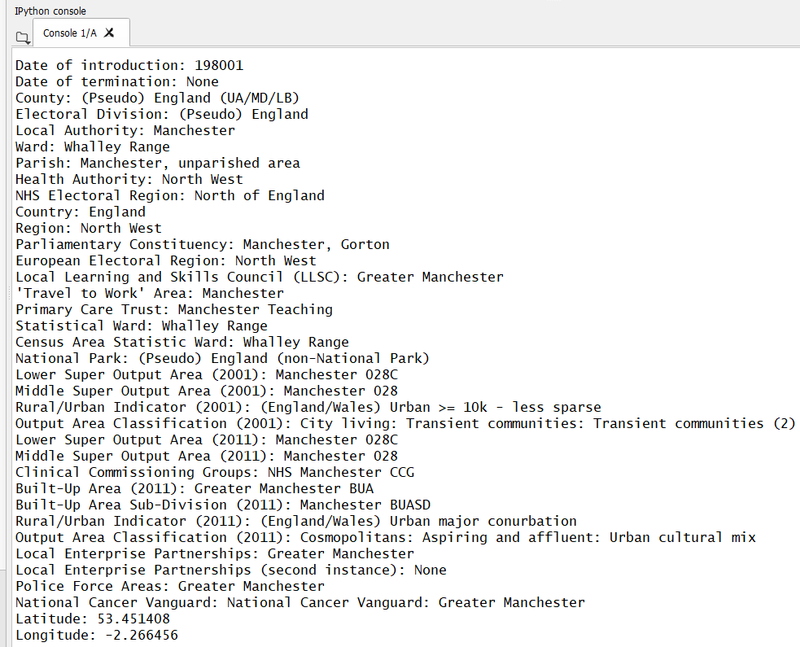 I also found the relevant lookup files; E01005302 is called Manchester 028C, for example. After downloading and unzipping, I imported all the data into SQL Server and made some minor adjustments such as removing terminated postcodes and creating the appropriate links between them. My preference for programming languages at this moment in time is Python as it is easy to use and very versatile. Therefore, I searched online for the best method of using Python to query a SQL database. Very quickly I came across a module called ‘pyodbc‘. Incidentally, if you’d like to attempt something similar yourself but are stuck with where to start, there is a helpful document on the Microsoft site that takes you through the process from start to finish. With my Python instance now able to pull out information for a particular postcode, I wanted to be able to display that information in a slightly more aesthetically pleasing fashion. One of the characteristics included in the database is the Latitudinal and Longitudinal information – for those not au fait with this, it provides a way of describing any point on Earth using just two numbers. A similar system is used in satnavs and GPS. 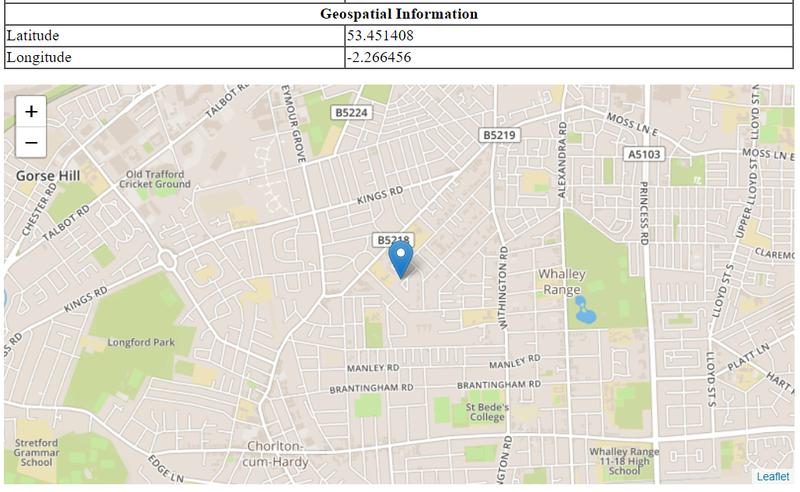 I’ve used these coordinates in the past for mapping and other GIS projects and thought it would be useful in this case to have a visual representation of the postcode. I have plans to develop the program further by possibly adding the ability to type the name of an area in lieu of a postcode and pull the information for that, also adding in boundaries so that a user can see the boundaries for their Local Authority, for example. Any other suggestions for enhancements or features are encouraged! sql_string = "SELECT * FROM ONSPD_NOV_2018_UK_NAMES WHERE pcds LIKE '" + pcd + "'"
#NB This is not accurate as it works from the location of the closest DNS, which could be quite far away!